Three Things You Should Know About Medical Device Regulations in Russia, November 2016. 1. Will the Deadline for Replacement of Registration Certificates be Extended? One month is left till the deadline to complete procedure of administrative replacement of medical device registration certificates issued before 2013. According to current medical device registration rules, such registration certificates will not be valid after 1 January 2017. Replacement is free for medical device manufacturers and in practice takes 30-60 days. Based on assessment from different sources, only 20-30% of such registration certificates have so far been replaced. The possibility of extending this deadline till the end of 2021 was discussed with the regulator earlier this year by the Russian trade association IMEDA and it is quite good news that this possibility has emerged in a draft of multiple amendments to current registration rules last month. Will this draft be approved by the Russian Government, and will the deadline be extended? We will discover in December. Russian GOST R ISO 18133-1-2015, identical to ISO 18133-1-2009, establishes general principles and specifies essential requirements for information supplied by the IVD manufacturer. Russian GOST R ISO 18133-2-2015, identical to ISO 18133-2-2009, specifies requirements for information supplied by the manufacturer of IVD reagent calibrators, control materials and accessories for professional use, and defines the requirements for labels for outer and immediate containers and to the instructions for use. Russian GOST R ISO 18133-3-2015, identical to ISO 18133-3-2009, specifies requirements for information supplied by the manufacturer of IVD instruments for professional use and also applies to apparatus, equipment and accessories intended to be used with it. Russian GOST R ISO 18133-4-2015, identical to ISO 18133-4-2009, specifies requirements for information supplied by the manufacturer of IVD reagents for self-testing, calibrators and control materials and accessories intended for use with IVD medical devices for self-testing. Russian GOST R ISO 18133-5-2015, identical to ISO 18133-5-2009, specifies requirements for information supplied by the manufacturer of IVD instruments and accessories for self-testing. In Russia, the application of standards is voluntary for medical device manufacturers; nevertheless, following these (and other) standards is the best way to demonstrate compliance during pre-clinical testing and expert evaluation within the Russian medical device registration process. The Russian medical device domain is regulated at different levels, which can sometimes seem confusing and contradictory. In November, the Russian healthcare regulator Roszdravnadzor published Order # 12848 with a full list of current regulations and legal acts, containing mandatory requirements, compliance with which is assessed during government control activity by the regulator (link in Russian). Chapters ##12 and 13 are devoted to medical devices and service maintenance of medical equipment in Russia. Although this order does not contain any new legislation, it summarises in a single document an exhaustive list of existing Russian Federal Laws, Government Resolutions and other regulations for this domain. From a practical standpoint, the document can be used as a comprehensive checklist for medical device manufacturers represented in Russia to ensure compliance with local regulations. Thank you for following the blog and newsletter. I am always grateful for your comments, and I encourage you to ask specific questions in the LinkedIn group. In November 2015 the Russian Federal Agency on Technical Regulating and Metrology (Rosstandart) published an updated version of its voluntary national standard GOST R ISO 18133, which is composed of five parts and which contains technical requirements on labelling and accompanying information and documentation for In Vitro Diagnostic (IVD) medical devices (part 1, link in Russian), IVD reagents (part 2, link in Russian), IVD instruments for professional use (part 3, link in Russian), self-testing IVD devices (part 4, link in Russian), and IVD instruments for self-testing (part 5, link in Russian). The new standard will come into force in November 2016 and will replace the version from 2009, which is valid currently. It should be recalled that the use of standards is voluntary, but recommended by Roszdravnadzor as the best way to demonstrate that a medical device meets all labelling requirements during the approval process and into further commercialisation. Another update from the Federal Agency on Technical Regulating and Metrology (Rosstandart) is the extension of validity of the Russian product classification code OKP (ОКП ) until 1 January 2017. The OKP code is a classification code which is present in every registration certificate (in addition to the medical device safety class and nomenclature classification) and is used by customs officials, among others, to define the amount of VAT exemption during medical device import and customs clearance. Previously, the deadline for transition into a new product classification system was set as 1 January 2016, which seemed to threaten a wave of uncertainty in calculation and in applying VAT exemption in practice. It should also be noted that some months ago Roszdravnadzor (the Russian medical device regulator) expressed the opinion that, in future, this code should be removed from the registration certificate. Armenia ratified the Agreement on common principles and rules of circulations of medical devices signed at the end of last year by EEU countries. In such a way, for November 2015, this agreement is approved by Russia, Belarus, Kazakhstan, Kyrgyzstan, and Armenia. It should be noted that, at present, unlike in other EEU countries, Armenia regulates the approval process for pharmaceuticals and not medical devices, which suggests quite deep further changes are coming in the medical device sector for the country. 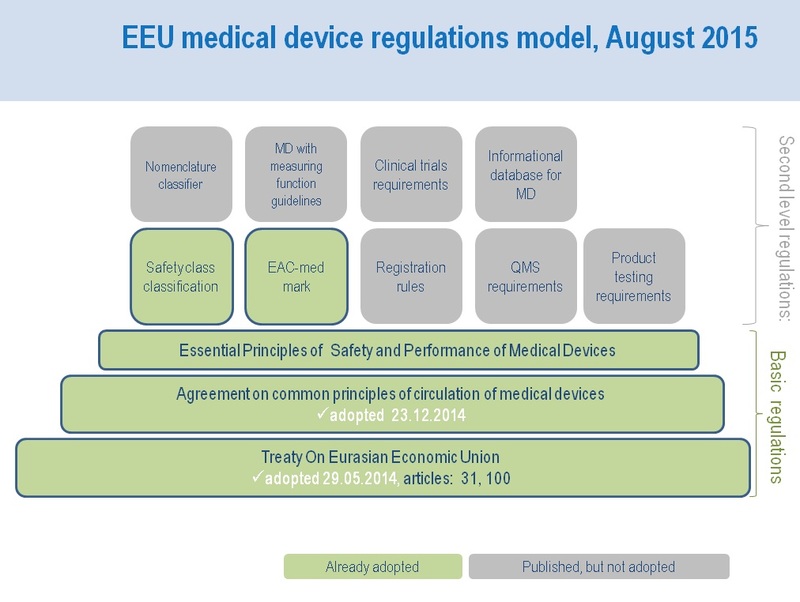 In conclusion, I would like to thank you for the following and remind that you can get regulatory updates about Russian medical device regulations from this blog directly in your e-mail using the ‘Follow’ button in the toolbar in the upper corner of this page.